Steep requirements. I tried running it on a PC similar to mine but with a Geforce 7600GT and even at the lowest settings possible it was unplayable, perhaps this is more to do with a lack of control over things to turn off but I could just not make it run well, my SLi 8800 GTXs were however able to handle it fine at maximum settings @ 1680×1050. This is the basic stuff. Not even any anti-aliasing settings? It does it’s job, but PC gamers generally expect more customisation. Also I’m assuming this game can be run in Direct X 9 mode seeing as it runs on XP, but there’s no information about how to force it to do that on Vista/7, if the game has that ability of course. Graphics wise it is quite a stunning game. The animations are extremely smooth except when certain characters suddenly stop lip syncing in cut scenes while the audio of them speaking is still occurring, or when they are moving about and suddenly twitch from pose to pose instead of animating that way, which breaks the atmosphere a bit, again this only seems to occur in certain characters, the main character for example is great compared to most of the others. The environment is quite well done, especially the change between occupied and unoccupied areas, birds flying around, guards attacking bystanders and searchlights in the sky are little things that really help immerse you in the game. There is however a certain blemish in the consistency, most of the game’s graphics are very polished, but some things are lacking, certain textures are low quality, there are numerous gaps where textures meet and the warehouse at the start of the game for example is obviously a simple structure but with low res textures and the minimum amount of polygons needed to make up the structure, it looks out of place in such a detailed and polished game. Another point is anti-aliasing, it does have it, but in the case of edges, similar to Bioshock 2 and S.T.A.L.K.E.R, it’s very low if not missing completely (to be honest I can’t tell), it is quite noticeable in this game occasionally, so those that love image quality may not like it. You can force AA now using nHancer but it is very slow, even forcing 2xCSAA slowed the game down to a crawl on my PC, however newer graphics card owners might be able to get playable frame-rates with it. This of course was the case for Directx 10, 9 (Windows XP) may be different. The in-car music is pleasant and doesn’t distract from the game, it helps paint the picture of the time period, this is the same as when you are in an occupied area with the distant air raid sirens and loudspeaker announces. I expected the main character’s comments about things (getting chased, falling from a height, entering a suspect area) to get annoying over time, however it still hasn’t, perhaps it’s due to it not being overdone when I don’t want it to. In the same vein, I particularly like the times when you are climbing a building and a french woman yells various comments like “get down from there” or “you’ll break your neck”, it really helps make it feel like a real living city rather than just a bunch of NPC zombies around you. The accents are a little cheesy and the lines are as well, but it works. The lip syncing gets let down occasionally though. This plays much better than other sandbox games I have played on the PC, the controls are simple and efficient, though 1-4 to select weapons and scrolling the mouse wheel to holster them? That’s a strange choice that I still can’t get used to, as is forgetting that you use E for some actions like opening doors, chatting with characters and mouse clicks for others, like placing dynamite, this caused many frustrating situations. The cars have a bit of a learning curve, they don’t handle like you expect them to, they seem to drive like hovercrafts in a way and they sort of slide while cornering like they’re hovering above the ground rather than being stuck to it which lets the realism down a bit. Once you get the hang of them it becomes easy to corner at high speeds etc. Most of the cars handle differently and go at different speeds which means if you want to use a car that can outrun the police there is actually one available that you can get quite easily. Physics works well, except in some cases the car can hit something and fly up into the air for no reason, or hit the ground it is driving on and suddenly stop. Cars in this game are very sturdy and even more so if you get certain upgrades or perks, they can take a beating and still be fine to drive around, you can keep a car for many missions if you want to, cars also stay where they are if you leave them, unless you reload or restart the game which can be handy if you need to duck down the road to blow some things up and come back to your car. Where most sandbox games make you lose your car constantly or hold back, this one gives you them by the truckload and lets you keep them for free. Combat is also a little hard, using your fists/feet to fight works well and is fairly easy and shooting guns is what I was used to but the cover system is a little weak, most of the times the character doesn’t properly hide or give any indication he’s under cover, then occasionally he will stick to something when you don’t want him to, or stick to the wrong wall, there is also this odd thing that causes the character to crouch automatically at odd times and if you’re crouching you’re being suspicious and this can get you in trouble with the Nazis pretty quickly. Also when you are behind cover you can’t shuffle your position, you will simply just walk out of cover again, so this can make aiming really hard if an enemy is obscured, your aim also changes between when you are shooting and covering, so aiming when you are covered, then coming out of cover, you must re-aim before you shoot, this is the kind of thing that can get your character killed in a firefight. Climbing buildings becomes tedious after a while and constantly having to press the spacebar to get him to climb from window to window which may have to be done up to 10 times to get up a building is frustrating, it’s slow to climb, there’s a small but noticeable wait before you can jump again, instead of hopping constantly from window to window. I found myself hoping there would be a drainpipe on each building that I went to just so I didn’t have to put up with that, as drainpipes can be climbed quickly and without stopping. A nice feature also is when blowing up things they can actually hit you and kill you if you’re not out of the area. The map allows you to select a location and will GPS-style guide you to it on the car, similar to GTA 4, though a lot more buggy. There are many different weapons in the game but I spent most of it with the silenced pistol and either a rifle or a Panzerschreck, upgraded of course, upgrades are cheap and it’s very fast to get enough contraband to unlock them all. The story is fairly simple, race car driver before the war, living in Nazi occupied France during the war and recruited into the liberation group, you must do missions for them in order to overthrow the Nazis. Nazis have been done to death in games but this one does it well the characters are believable to a degree and don’t make me cringe as much as other games do. The flashback at the start of the game where you play the character months before really helps see the world that he is living in and gives a good backstory. If GTA 4 was a train wreck, this was the Hindenburg Disaster, this game has a serious case of the gremlins. Apart from the physics issues above, the game sometimes freaks out and throws cars from the sky in the main menu screen but that’s just the tip of the iceberg. At release if you had an ATI graphics card there was a significant chance that the game wouldn’t even start up for you, if you had a quad core CPU the game could freeze occasionally and everyone experiences problems with the game crashing when opening notes. With the one and only beta patch released some of the issues were fixed, some ATI users were able to start the game and some crashes stopped, their workaround for the crashes on quad core CPUs was to change the affinity when playing the game to 2 CPUs only. They seem to have not acknowledged the crash when opening up notes either. What makes it worse is that due to Pandemic games not being with us anymore it’s unknown if another patch will be released. To note: After installing the latest Nvidia Forceware drivers (197.45) the game has stopped needing the affinity workaround and hasn’t randomly crashed yet, though I don’t know what they would have to do with it I’m just happy it is working for now. 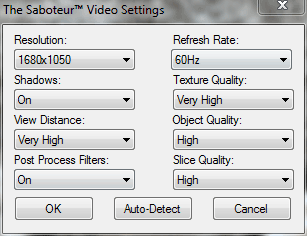 Graphics – Needs more options, anti-aliasing or at least control of, small glitches, consistency issues. Sound – Bad lip syncing. Gameplay – Bad detection of cover, random crouching (bug maybe?). Bugs – Gremlins, very very bad, but surprisingly playable. Graphics – Smooth animation, generally polished. Sound – Atmospheric and enjoyable. This was a fun and enjoyable game, if it wasn’t so damn buggy it would be one of the best games I have played this year. it may be a bit of a console port that we are so used to seeing these days but if you’re worried about the bugs get a console version.